"You know Al, I had (take your pick) 1 thru 10 years of Piano Lessons and I can't play a note today!" "I HATED Piano Lessons, though I sure wish I played today. My teacher used to crack my fingers with a ruler when I made mistakes." "My teacher used to read the newspaper and have me repeat the same piece several times without ever ONCE analyzing what I was doing--either right or wrong! 'Practice this some more and come back next week.....(yawn).............NEXT!' "
Do any of these "tragic-comedies" sound familiar? If so, please continue! My purpose here is to examine these--and other--Music students' dilemmas and the necessity of a Solid Musical Foundation, in order to allow practitioners to enjoy, proceed and progress at any stage of their life in their particular Musical Direction, regardless of Amateur or Professional status. Generally speaking, people of all ages of Western European and American Cultures take-up the study of a musical instrument(s), attaining varying degrees of proficiency. Some of these persons are self-taught. The “Traditional” approach involves more formal (i.e. CLASSICAL ) study with private instructors and / or classes sponsored by various Music Schools and / or Conservatories. Initially, my focs will discuss these FORMAL studies. The Second Point is in Comprehending the student's Misunderstanding. It is most difficult to imagine yourself not knowing something when you do know it very well. Yet, in order to constructively convey one’s ideas to the pupil, it is necessary to realize what they DO NOT understand. In effect, putting yourself inside the mind of the student in order to clarify your conception thru his / her eyes. The mere parroting of facts without clarity is a fundamental waste of time. It is imperative that the instructor continuously analyze and clarify what is not being understood until the student grasps the concept. between Student and Teacher. This is, of course, applicable in any learning discipline, but is quite often neglected by "Professional" Instructors seemingly interested only in a "steady job" and / or paycheck with no genuine desire and / or ability to communicate their knowledge. HOW SAD! A common(?) complaint (i.e rationale) is that the student "has no talent; does not practice enough; has no interest;" etc. Admittedly, these problems do exist in varying degrees--even for students of the most conscientious Pedagogue. Nevertheless, the Primary Duty of a Teacher is Communicating Enthusiasm. Without this fundamental energy, progress will be--at best--limited, as well as potentially detrimental to emotional and / or spiritual development. Nothing dampens a pupil's interest more rapidly than a low-energy instructor. If the teacher is not interested, will anyone else be? Without Enthusiasm, any significant progress will, at best, be difficult. Jazz Music Education is a relatively recent occurrence. Though some isolated “Jazz Curriculums” did exist in the United States in the early Sixties--BERKLEE and NORTH TEXAS STATE being two of the “pioneers,” Most University-Level Music Programs did not consider Jazz Music “worthy” of serious study. Gradually, changes took place thru the late Sixties and into the early Seventies. Jazz Music Education has since evolved rapidly and is today regarded as “respectable” and even equal with Classical Music Education. The fundamental difference in approach between Classical and Jazz Music is that Classical Music is primarily concerned with execution and interpretation of written Music composed--for the most part--during the Sixteenth Century to the Present. Jazz Music--on the other hand--is primarily concerned with Improvisation over Compositional Forms originating--though not confined to--the middle Eighteenth Century to the Present. These Forms include the Blues, (I Got) “Rhythm Changes” (i.e. “changes” are chords), and “American Standard Song,” aside from other Contemporary and Traditional Compositional Forms. By definition, Improvisation is Spontaneous Composition. 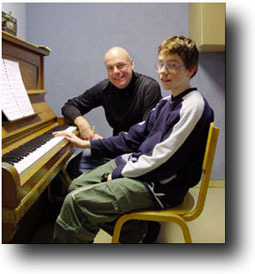 Therefore, while Classical Music Instruction emphasizes Technique (Instrumental, Compositional, Educational), Jazz Music Instruction should primarily emphasize Composition (Melody, Harmony, Rhythm). In essence, effective Jazz improvisation should sound formally composed. Conversely, Classical performance should sound improvised! Obviously, it is essential that both Classical and Jazz Music be studied for different--but congruent--purposes. Whereas Classical studies develops the tradition of the Instrument, Jazz studies develop the individuality of the improviser. It is necessary that an Improviser possess the techniques in executing his / her Compositional (Improvisational) ideas. This will be most effectively accomplished by balancing both disciplines. It is essential that an effective Jazz Music Program commence with a detailed emphasis of Western Music--both European (Classical) and American (Jazz). This includes a vast--but concise--Instrumental, Compositional, and Historical perspective. All these factors are connected. In developing an effective Jazz Music Curriculum, there are several areas to consider. These can be basically summarized as Instrumental, Compositional, and Conceptual. I will discuss areas related to the First of these Three Topics: Instrumental Considerations. As discussed earlier, the fundamental basis of Instrumental Control is rooted in precise traditional exploration of the Instrument. Initially, this is connected with the “Classical” approach regarding one’s Instrument of choice. Briefly these are Repertoire, Scales, Arpeggios, Sight-Reading, Ear Training, etc. However, the methodology approaching this somewhat monumental task is--sadly--usually suspect. One of the most prevalent weaknesses in many musicians--at every level--is the neglect of basic rhythmic accuracy. This is not to be confused with “time” and / or “feel” (separate--tho connected--concepts to be discussed later). This is simply being able to correctly count and play the note values within a Composition--regardless of tempo--with a mechanical consistency. In effect, learning to read accurately! However, this is only the beginning. The Musician must then translate this “reading ability” to the instrument and muscularly, intellectually, and aurally practice slowly and accurately. In doing so, it is imperative that a metronome be correctly utilized. Effectively employed, a metronome is the Musician’s most valuable tool. Unfortunately, most Teachers are unable to constructively convey correct employment of this most important tool, thus severely limiting potential results. Practicing Melody with four beats (Mechanically) to the bar; on beats one and three (Classical); on beats two and four (Jazz); slowly and gradually increasing Tempo are merely a starting point. One must diligently practice playing the note(s)--continuously searching until finding the center of the beat consistently! A noticeable flaw is the inclination for Players to practice “on top” (i.e. ahead) of the Metronome Beat(s). Although to a lesser extent, playing / practicing “behind” the Beat also occurs, the objective is finding where the exact center of the beat “lays” in the metronome “click,” and then where and how to play ahead, behind or in the center. When one is learning to play an instrument, the comprehension and diligent practice of rhythmic accuracy is paramount to developing control. Music is about Rhythm! Without Rhythm, there are only notes! Those who continuously refine their to Rhythmic approaches, will ultimately play less notes and more Music! WHAT IS SPONTANEOUS COMPOSITION ? Basically, the three fundamental characteristics of Composition are Melody, Harmony and Rhythm. As Harmony is the “Compositional Blueprint,” I have elected to commence with this area. Harmony--by definition--is sound resulting from the playing of more than one note simultaneously. A comprehensive understanding of Harmony is absolutely necessary for the Jazz Improviser to be effective. Harmony affects all aspects of an Improvisation. It accompanies, indeed often shapes Melodic content; it enhances “comping” (Rhythmic Punctuation); and / or it may sophisticate or simplify--add or detract from an Improvisation. In examining Western Harmony--be it Classical or Jazz--the Instrumental “Foundation” is the Piano. Most skilled Improvisers have a solid grounding on Piano because it is at the Compositional root of Western Music. Thus, when developing one’s Harmonic Approach, a comprehensive study of Composition on the Piano is advised. Of course, this does not imply one needs to become a Piano Virtuoso to understand Harmony! It is imperative, however, to “see” the Piano so as to develop Harmonic Clarity on the Keyboard--as well as one’s chosen Instrument. The primary focus in the development of Fundamental Jazz Harmony is comprehension of the Key System. The foundation of the Key System are in the Basic 12 Diatonic Major and Minor Scales. This is not synonymous with the practicing of Scales for Technique. Rather, it is comprehending the Harmonies constructed on each note of the Scale; the key signatures of the Major Scales and their relationship to the Relative and Parallel Minor Scales; and the inter-relationship of chords within any Tonality. A clear comprehension of the Key System is of the utmost importance, as it affects every Improvisational Consideration! In addition, knowledge of Chordal Voicings is essential. Great Jazz Musicians all have a Definitive Voice--indeed, this is the essence of their greatness--outlined by their Harmonic Conception which is displayed in conjunction with both their Melodic and / or Compositional approaches. Thus, it is necessary that knowledge of clear, concise Voicings be recognized and observed. Once again, this can be most effectively accomplished studying the Piano. It can be investigated by listening to recordings, speaking with other musicians, and anyone who can convey a simplified and intelligent approach. Without a fundamental Harmonic grounding, it is difficult to improve one’s Improvisational approach. One must be fluent with the Key System to be Harmonically Sound. In essence, Harmony is about one’s own Sound Conception. If one searches for his / her Voice in the Music, it may be found. Nonetheless, having a solid grasp of Harmony is only possible thru a well-developed Harmonic Approach. It is necessary--among other things--to “shape” Harmony to “fit” Melody, “bend” the Harmony while accompanying Soloist(s), and “punctuating” the appropriate Harmonies within the Rhythm. The Melody of a Composition is its most distinguishable characteristic. Unlike Harmonic and Rhythmic Forms, which can be similar--and even identical--in any number of Compositions, Melody is the Voice of a Composition. Thus, although Harmony and Rhythm are essential in the structure of a Compositon, the Melody is its real identity. With regard to Melodic Improvisation, one can improvise on / over the Melody or inside / outside the Harmonic structure. The former is achieved by embellishment, accentuation, and / or variation of the Melodic Content. The latter by being fluent within the basic Harmonic structure. When improvising over the Melody, it is essential to grasp the Melodic content. In other words, merely “faking” the Melody is insufficient. It is imperative to comprehend--in order to truly conceive--the Melodic Idea. This requires awareness of Melodic / Compositional / Lyrical (If it’s a Song) “ebb and flow” within the Rhythm, and relative Harmonic characteristics both inside and outside the structure of the Composition. This may also include Theme and Variations. Most Classical Composers frequently employed this approach by utilizing Thematic Material from one Composition and re-inventing the Melodic content over an expanded Compositional framework. All these aspects are valid approaches improvising on or over the Melody. When one chooses to improvise thru the Harmonic structure, it is fundamental to understand the “Harmonic Blueprint.” Again, it is not enough to merely possess awareness of the Basic Harmony, though this is certainly necessary! However, the Innovative Improviser “re-invents” the Harmony to accompany his / her Improvisations. It is possible then to essentially “re-write” the Composition while effectively maintaining a connection with the original structure. Thus, one might approach Improvisation in the following manner: (a) Statement of Original Melody; (b) Several “Choruses” (i.e. Playing thru the Compositional Form, improvising thru--occasionally with variations--over the Melody; (c) Several additional Choruses gradually progressing on / outside / inside the Harmony--Hopefully achieving an energetic climax; and (d) “Bringing it back down” gradually and either returning to the Melody or continuing the Improvisation with another Band Member(s). In developing a solid conception of Rhythm, it is essential to possess an understanding of “Feel / Time”--Where to place the note(s). Having control over this rather “nebulous” concept requires one to understand the Cultural, Technical, and Aesthetic connection(s) concerning beats 1 and 3 (Classical)--and 2 and 4 (Jazz). Knowing where the “inside” of the Rhythm--often referred to as the “Groove” or “Pocket” is. How to create Rhythmic energy within this framework requires serious investigation--beginning with an awareness of how to practice with a metronome. Before one can play good “Feel / Time,” it is imperative to begin by practicing “mechanically.” Conceiving how it “Feels” on beats 1 and 3--as well as 2 and 4. In addition, the technical awareness of how different “Feels” are created is of the utmost importance. For example, having the ability to differentiate between an “Eighth-Note Feel” and a “Triplet Feel;” a “Twelve-Eight Feel” as opposed to a “Six-Eight Feel;” or “Four - Four” vs. a “Cut-Time Feel;” etc. is essential. After studying these various Time Signatures, they become rather obvious. But when one is beginning his / her studies in Rhythm, these are complex factors. It is most important finding within one’s self where the Center of the Beat lies. When practicing without a metronome, this can simply not be achieved with the necessary consistency. Also, Emotion and Feel are not synonymous! One can be an Emotional player and have bad Time--just as one can have good Time and lack Emotion. The two are congruent but not necessarily similar. Too often, these two factors are mistaken for one another. Ideally, both are necessary. In addition, I must differentiate between a Simple Metronome and any other type of Rhythm Machine. In our “High-Tech” World, far too many would-be musicians attempt practicing with elaborate metronomes--or worse--Drum Machines. Utilized correctly, a Drum Machine is a useful LIVE / Studio tool, especially in Contemporary Music. However, when one practices with a Drum Machine, one does not develop good time! In effect, what does happen is the student begins relying on the Machine to create the Time Feel instead of developing the means to create his / her own Time Feel! Using a Drum Machine can be fun if one is playing, experimenting, composing, etc. But when one is seriously practicing with a Drum Machine, this is simply not a good idea! After much investigation, I have come to the conclusion that the most accurate approach in developing Good Time is in the creative utilization of the most basic and simple metronome. Only then is one forced to examine and experiment with all the potentialities which creative rhythmic practice accomplishes . Rhythm is the “life-force” of Music. Good Music must breathe and flow. Without good Rhythm, this is not possible. Notwithstanding some physical defect, most people are able to hear. Unfortunately on the other hand, many people do not know how to listen. The difference is, hearing constitutes awareness of Sound while listening is the comprehension of Sound. The ability to listen is especially necessary for Musicians. Unfortunately, this is often neglected--both by Educators and the Musicians themselves--simply because most are basically unaware of these distinctions. Nonetheless, until mastery is achieved, listening is the most essential characteristic in understanding the language of Music. Notwithstanding one’s dedication, over a period of time most aspiring Musicians achieve some degree of proficiency on their instrument. Still, an inability to analytically listen hinders any evolution beyond the basic exercise of playing. The result then becomes control of the instrument instead of playing Music THRU the instrument. In order to improve one’s ability to listen, one must first want to! Many Musicians--especially the most inept in this regard--tend to deny problem(s) exist. One should ALWAYS practice one’s deficiencies--though only the REALLY good ones do! However, effective listening begins by dealing with the Master Musicians who have--or are--setting the standards for excellence and innovation. If one wants to comprehend Traditional Jazz (“New Orleans / Dixieland”), it is essential to investigate the Music of Louis Armstrong; in understanding Classic Jazz (“Swing / Be-Bop”), it is essential to investigate Lester Young, Thelonious Monk and Charlie Parker; in grasping Modern Jazz (“Post Bop / Contemporary”), it is necessary to check-out Miles Davis and John Coltrane; in approaching the Avant-Garde, one must pursue the Music of Ornette Coleman and Cecil Taylor; and in learning Jazz circumventing all these eras, one must absorb the Music of Duke Ellington. All these Musicians were directly involved in the evolution of Jazz Music. As a starting-point, the Music of these Masters must be thoroughly absorbed--Conceptually, Intellectually, Structurally, Stylistically, and Aurally. Naturally, the many Musicians who played with them and contributed to their legacies (Earl Hines, Bud Powell, Max Roach, Dizzy Gillespie, Jimmy Blanton, Johnny Hodges, Bill Evans, Herbie Hancock, Tony Williams, Wayne Shorter, McCoy Tyner, Elvin Jones, etc.) must also be examined. The reward is “speaking” The Language of Music. Jazz Music is a “Life Process” that requires years of study, practice, analysis, and most importantly--Love! Because if you do not Love the Music, you will not devote the necessary amount of time developing your own Sound within the Music. JAZZ: You either LOVE it or LEAVE it! In addition to his Professional Performance Responsibilities, Al Blatter is Professeur de Jazz at the ECOLE INTERNATIONALE de Geneve at CHATAIGNERAIE & NATIONS.